We had been prepared for the demise of this old cactus. It has been in this pot for more than 10 years and surprised us with the first flowers we can remember. It may still be on its last legs, but if so, it is going out in a blaze of glory! S uki greets her friend, Barb Seils, who has large dogs as pets, and enjoys holding a small animal. Suki doesn't mind being held (at least not much!) for short periods of time before going about her business of the day. Marcia's brother, Ken, took a wide-angle picture that shows much of the end of the studio that is attached to the house. Marcia is drawing fabric choices from her closet stashes to help sister-in-law Patty work on her in-progress quilt. 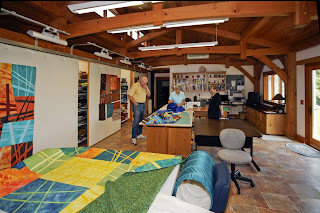 One of Marcia's Jet Trail quilts (#5) is spread on the table, and the next ones in progress are on the design walls. 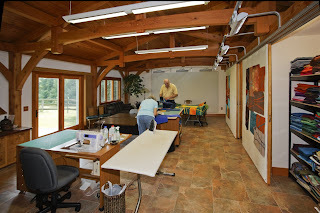 Another wide-angle view of the opposite end of the studio featuring the large design wall at the western end of the room. Clicking on these two studio pictures will show more of the wonderful timberframe structure.